Photos by Michelle Davies | The Journal Gazette Olivia Stoy, 14, plans to undergo a bone marrow transplant next month to fight her cancer. Her donor is her brother Preston, left, a perfect match. The two are seen at their home in Steuben County. Michelle Davies | The Journal Gazette Olivia designed this beaded bracelet sold by accessories business Emily Kai. Proceeds benefit her upcoming bone marrow transplant. • Donate to her GoFundMe campaign. Search “Olivia Stoy” at www.gofundme.com. ASHLEY – Olivia Stoy had the end in sight. Early this year, the teen cancer patient's hair was growing back, and her last chemotherapy treatment to fight a form of non-Hodgkin lymphoma was on the calendar. 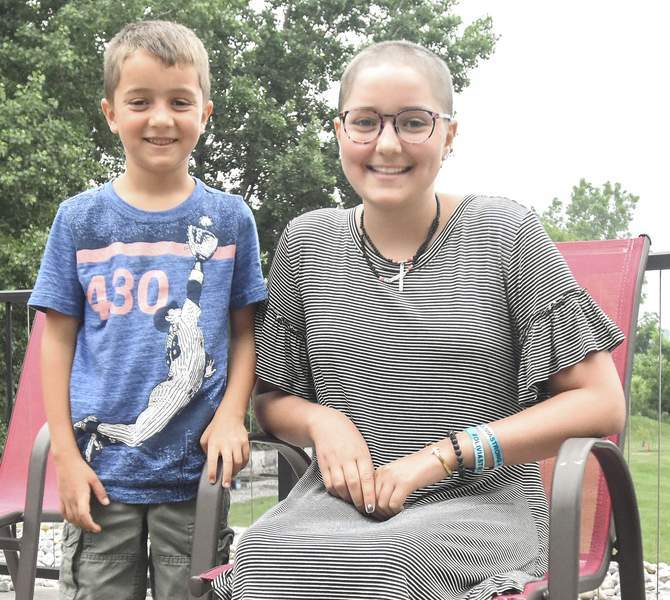 A relapse changed that, disrupting her final months at Angola Middle School and forcing her to scrap a spring break trip to the Grand Canyon and summer plans at Camp Watcha-Wanna-Do, which is for children with cancer. “It was really hard to accept that this had happened again,” Olivia said last week, sitting with her mother outside the family's Steuben County home. Her summer schedule now includes a bone marrow transplant – a treatment made possible by her brother and an outpouring of financial support from the community. Olivia's parents are self-employed and have a shared insurance plan through their church. They enrolled years ago, knowing it didn't cover organ or bone marrow transplants – procedures they never thought they would need, said Megan Stoy, Olivia's mother. Once the unexpected became the doctors' recommendation, Olivia's mother, father and younger siblings – Preston, 7, and Evelyn, 11 – took a blood test to determine whether a family donor was possible. Her sister was a 50 percent match; her brother, 100 percent. Various fundraisers – including bracelet sales, a GoFundMe campaign and a block party this Friday in Angola – are helping the Stoys shoulder the financial burden, which is publicized as a negotiated cost of $350,000. Much of the support is local but has broadened as Olivia's story has spread, reaching media outlets outside Indiana, including “Inside Edition” and the Miami Herald. The increased attention has kept the family busy, her mother said, adding they are grateful for the support. “It's just amazing to see the community come together,” she said. She credited the response to living in a small community and Olivia's good heart and giving nature. The family's Facebook page about Olivia includes information about fundraising efforts. While some businesses are collecting donations in canisters, others are pledging to donate all or some of their sales on certain dates. Emily Bryan, who owns Fort Wayne accessory business Emily Kai, said her effort to help Olivia spread like wildfire. Olivia designed a bracelet featuring coral, turquoise, moonstone and lava stone beads held together by gold elastic – the color of childhood cancer. 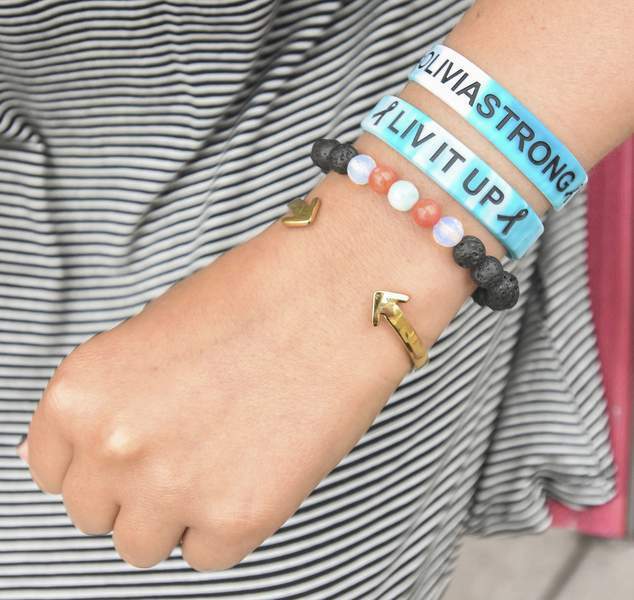 The Lava Liv bracelet is a tangible reminder to stay strong, confident and courageous, Olivia said. Emily Kai's website features the meaning behind the $20 bracelet and includes video of Bryan and Olivia. The feedback has been positive, Bryan said, noting the initial batch of 400 bracelets quickly sold out. “It's much bigger than what Emily or we could have imagined,” Olivia's mother said. Well-wishers as far away as New York, Kansas, Florida and Alabama have left encouraging messages on the website, with a few noting they saw Olivia's story on their local news. “People were really empowered by Olivia,” Bryan said. In a Facebook update last week, the family reported the fundraising tally surpassed $132,000 and reiterated the importance of the donations. “After her relapse this past spring, Olivia's doctors made it abundantly clear that a bone marrow transplant would be her greatest chance at lasting remission and a fulfilling, healthy life,” the family wrote. Olivia plans to use any leftover money to help other patients, she said. It will be a while before Olivia can again fill her calendar with activities her illness forces her to avoid. Because of the transplant, she won't return to school in August. She must stay in the hospital 50 days after the procedure, and places like church, school and stores will be off limits for nine to 12 months, her mother said. Olivia is thankful for everyone who is making that future possible. “It shows that they care for me,” she said.